First preheat your waffle iron. Make the sauce by combining all sauce ingredients in a medium saucepan and bring to a boil over medium heat. Whisk sauce for about a minute or until it begins to thicken, remove from heat. For the waffles, first make your flax egg by mixing ground flax seed and 3 Tbsp. water or milk in a small bowl, mix it really good until it becomes thick and gelatinous, set aside. Next, make your buttermilk by mixing the soy milk and lemon juice, set aside. In a large bowl, combine flour, cornmeal, baking powder, baking soda, and salt. To the soy milk add the flax mixture, brown sugar, oil and vanilla and combine. Add the wet to the dry ingredients mixing until just combined. 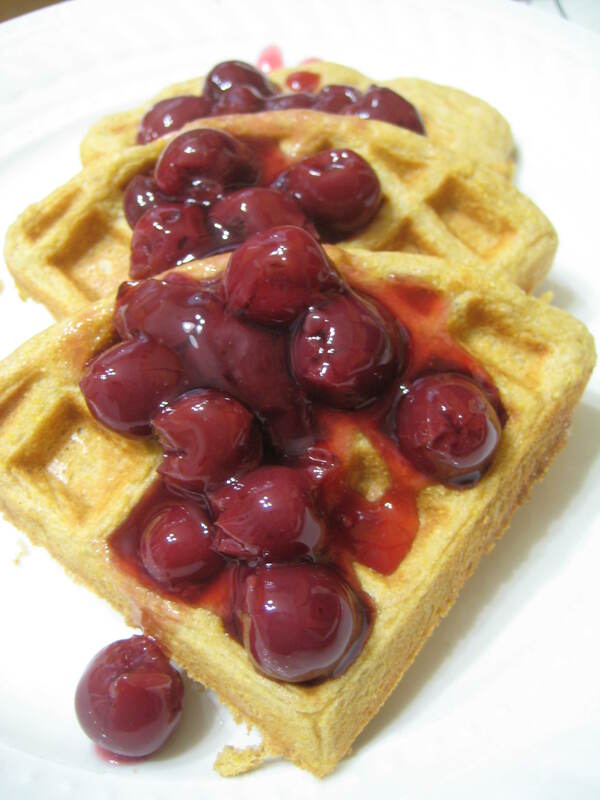 Make your waffles and top with cherry sauce.